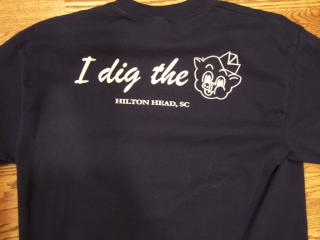 With a name like Piggly Wiggly how could you not have fun as a marketer? My first exposure to the Piggly Wiggly name brand was as a kid growing up in Rome Georgia. We had a Piggly Wiggly grocery store in town close to my grandparents house. It was affectionately known as “Pigs” in my family. I can remember a roller device in the middle of the store where they would push boxes of groceries onto the floor and of course the logo that reminded me of Porky Pig. Then life happened. I moved away from Rome to the Atlanta area and didn’t live near a store. It became a faded memory. This little Piggy went wee-wee-wee all the way home. Then a couple of years ago, it came back me. While on a family trip in Charleston SC, we spotted a local Piggly Wiggly and my daughter suddenly piped-up that she wanted a shirt. It took me by surprise because I had no idea she had ever heard of the name and couldn’t believe a grocery chain was marketing shirts with it’s logo. Apparently it was “in” with pre-teen girls to have one of these shirts. So of course we stopped in to get one. I’m on vacation again with the family. This time in Cooperstown New York watching a little league baseball game. One of the players was, we’ll say, large for his age. To my amazement, his team parents start chanting “pork chop”, “pork chop”. He was every bit of it. He had hits, made catches, and even pitched. Then as if by fate, there was a man sitting near us with a Piggly Wiggly shirt that said “I dig the pig.” It was complete coincidence to the game because he had no affiliation with the other team. It became the topic of conversation that night with our friends. One of my best friends, not passing up on the opportunity to make a moment out this event decided to buy me a surprise gift a few weeks later as he vacationed in Hilton Head. 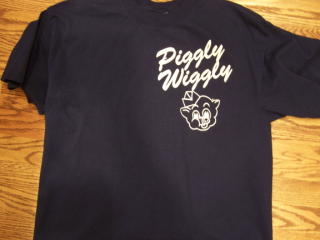 You guessed it, a Piggly Wiggly shirt. Now how cool is this? I like the idea of company branded merchandise as a marketing vehicle. What better way to get paid advertising than through satisfied and loyal customers wearing and using items with your logo? Oh, paid in this model isn’t the company paying but someone paying the company. The trick is in how to make the merchandise something a customer would want to buy and use. I can’t see myself wearing a BP gasonline Tshirt but the Hess gas truck was sure cool as a kid. So get creative. Offer some merchandise as a cross-sell. Get some advertising and make a little change at the same time. Do you dig it?